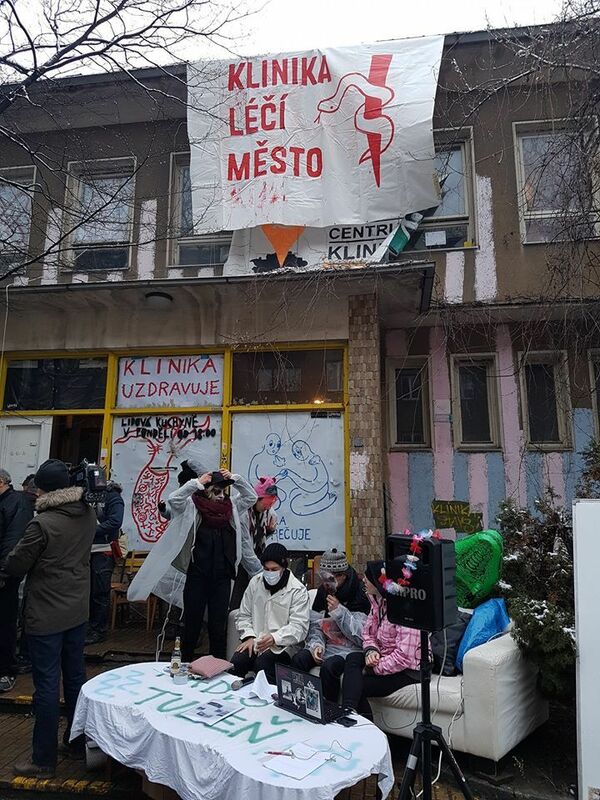 After two years of back and forth, police and private security have been sent in to clear out the autonomous squatted centre, which has been an important cultural and community building since it opened in Prague in 2014. Originally published by Freedom news. The centre, which was opened on the site of an abandoned clinic, has been open for the last four years and has had numerous legal showdowns with both local government and the legal owners SŽDC, which have been leading today’s eviction — but had thought that an undertaking by the city to take over the building for use as a social centre would forestall such efforts. Markéta Juřicová, a member of the Klinika collective, said: “Managers of SŽDC (state railway company) are lying when they claim that they are forced to evict the building by court. It’s their own decision. Municipal district Pague 3 nor the whole Capital City don’t want Klinika to be evicted. Jakub Ort from ASC Klinika said: “There are no reasons for leaving the house. In the case of eviction, the building will be empty for months and years and it will dilapidated. There is even a threat of demolition. Moreover, it is winter and there are people in the house who have no place to go”. SŽDC has said it wants the site clear for building work, however critics have pointed out that works are unlikely to begin before the spring of 2020, meaning that even if the firm intends to build, the building will be a ruin for at least the next year. Some background info taken from Trespass. The third issue of Trespass Journal is available now.